Assyrians around the world are protesting what they consider to be Turkey’s attempt to oppress and eventually close the oldest surviving Syriac Orthodox church on Earth. Mor Gabriel Monastery, founded in 397, has survived centuries of oppression, including the World War I genocide against indigenous Assyrians and Armenians by Ottoman Turkey. Its remote location, perhaps, is one reason. A local prosecutor in August 2008 initiated a separate court case against the monastery after mayors of three villages complained the monks were engaged in “anti-Turkish activities” and alleged they were illegally converting children to the Christian faith. Monks say the mayors are instigating anti-Christian feelings by accusing Mor Gabriel of being against Islam. Villagers in neighboring Çandarlı, a settlement of 12 humble houses with no paved roads, said they had nothing against Christians and accused the monastery of taking land they need for cattle. “There is a continued campaign to destroy the backbone of the Syriac people and close down the monastery,” said Daniel Gabriel, director of the human rights division of the Syriac Universal Alliance, a leading Syriac group based in Sweden. “These proceedings cannot take place without the sanction of the Turkish government. If the government wanted to protect the Syriac Christian community, it would stop this case,” he said. Many churches and monasteries in southeast Turkey — known to Syriac Christians as Turabdin or “the mountain of worshippers” — are now abandoned and in ruins. “You need people to have a church. Without the community, the church is only a building,” said Saliba Özmen, the metropolitan, or bishop, of the nearby city of Mardin. Photos from a recent demonstration in Europe are available at a Germany-based website. It is rare when France, the Russian Federation and the United States are part of a small group that vote the same way in the United Nations. But today they joined the states of Angola, Armenia, India, and Vanuatu in voting against a General Assembly resolution by the Republic of Azerbaijan that calls on Armenian forces to withdraw from the Armenian indigenous region of Nagorno Karabakh – a de facto but internationally unrecognized republic in the ex-Soviet world. The U.N. General Assembly on Friday demanded [on March 14, 2008] that Armenian forces withdraw from all occupied territories in Azerbaijan, but key mediators in the Azeri-Armenia dispute rejected the non-binding resolution. There were 100 abstentions and many other countries chose not to participate in the vote, which Western diplomats said was a reflection of the fact that most people felt the Azeri resolution was not a balanced picture of the problem. “This resolution was not helpful,” said a diplomat from one of the three co-chairs of the Minsk Group — Russia, the United States and France. The Minsk Group is a committee of countries working to bring about a peaceful resolution of the disagreement over Nagorno-Karabakh, the disputed Caucasus mountain enclave. The group was established by the Organization for Security and Cooperation in Europe (OSCE) in 1992. A U.S. statement on the resolution said the three Minsk Group co-chairs all voted against the resolution because they agreed it represented a “unilateral” view of the dispute. Last week Azeri President Ilham Aliyev said Kosovo’s newly declared independence from Serbia had emboldened Armenian separatists in Azerbaijan’s mountainous enclave of Nagorno-Karabakh. Both Armenia and Azerbaijan have accused each other of stoking the recent violence there. Announcing support for the resolution on behalf of the Organization of the Islamic Conference (OIC), Pakistan’s representative quoted Azerbaijani allegations of “destruction of Azerbaijan’s cultural and historical heritage, including Islamic monuments.” Ironically, Azerbaijan has continuously denied the European Parliament investigation of material heritage destruction in the South Caucasus – raising questions of its sincerity in protecting heritage. 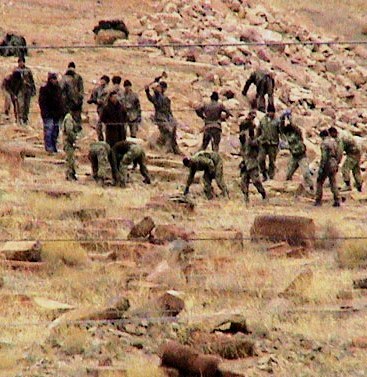 And needless to say, Azerbaijan’s rhetoric of “Armenian vandalism” only started in late December of 2005 – after an eyewitness videotape from the Iranian-Azerbaijani border showed servicemen of Azerbaijan’s army reducing the world’s largest Armenian medieval cemetery to dust. The representative of Armenia said it was unprecedented for a draft resolution to be put to the vote without there having been any consultations on it, in cynical disregard of the foundation of the United Nations and every other organization. The purpose of the drafters had never been to encourage or facilitate discussion. It was simply a way for Azerbaijan to list its wishes on a piece of paper. If the intention had truly been to contribute to the success of ongoing negotiations, Azerbaijan would have put its energy into the existing Minsk Group negotiation format. He said that, after Azerbaijan had militarized the conflict 20 years ago, there had been a full-scale war between Armenians of Nagorno Karabagh and Azerbaijan. The result was thousands dead, nearly 1 million refugees and lost territories on both sides. Today, there was a self-maintained ceasefire and negotiations under the auspices of the Minsk Group. Despite that and attempts by Azerbaijan to divert from the peace process, the talks were indeed moving forward. There was now a negotiating document on the table that addressed all fundamental issues, security being foremost among them. The Minsk Group co-chairs had presented the latest version to the two sides at the OSCE Ministerial Meeting in Madrid. Yet, Azerbaijan risked sabotaging that process by presenting a draft that ignored fundamental international norms and the real issues, which must be addressed, he continued. In short, the draft was counterproductive. It called for the immediate and unconditional withdrawal of armed forces, while ignoring the security vacuum that would result. Who would be responsible for the security of the population of Nagorno Karabagh, which was already vulnerable, in the absence of “international cover” safeguarded by those very armed forces? The draft also called for self-governance within Azerbaijan, he noted. That had become impossible 20 years ago and was not possible today, when the security of the Armenian minority was clearly endangered. The international community had demonstrated that it understood that, in various conflicts around the world. The Government of Azerbaijan had forfeited its right to govern people it considered its own citizens when it had unleashed a war against them 20 years ago. Armenians would not return to such a situation. Just as victims of domestic violence were not forced back into the custody of the abuser, the people of Nagorno Karabagh would not be forced back into the custody of a Government that sanctioned pogroms against them, and later sent its army against them. Noting that the draft also asked for commitment by the parties to humanitarian law, he questioned their commitment to the non-use of force, the peaceful resolution of disputes and all the other provisions of the Helsinki Final Act. The draft talked about territories and refugees, but not how the consequences of the conflict would be resolved if the original cause was not addressed. Refugees and territories had been created by an Azerbaijan that had “unleashed a savage war against people it claims to be its own citizens”. Only when the initial cause was resolved would the fate of all the territories and refugees in question be put right. The draft was a “wasted attempt” to predetermine the outcome of the peace talks, he said. That was not how responsible members of the international community conducted the difficult but rewarding mission of bringing peace and stability to peoples and regions. The co-chairs had found that today’s text did not help the peace talks. Armenia also knew it would undermine the peace process and asked other delegations not to support it. Vandalized graves; broken stones. Another Christian cemetery has been erased in the Republic of Azerbaijan this time containing not only Armenian, but also Russian, Georgian and Ukrainian graves. 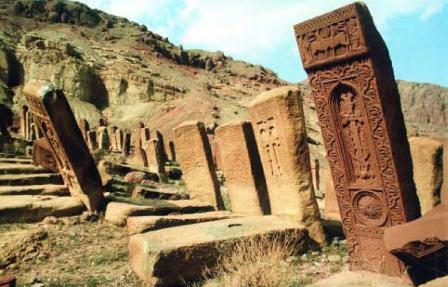 Shockingly enough, the photographs of the now-gone cemetery were taken in December of 2005 – the same month when the medieval Armenian cemetery of Djulfa was reduced to dust by the Azerbaijani army. According to the website, the cemetery is being replaced with elite houses.